Welcome to the website of Corbie Mitleid! Corbie is a Certified Professional Tarot Reader, Certified Psychic, trained medium and ordained minister. Her work is showcased in Robert Schwartz’s breakthrough series, YOUR SOUL’S PLAN and YOUR SOUL’S GIFT, highlighting her ability to retrieve clients’ past lives in detail. With over 40 years’ experience, Corbie’s abilities include spiritual/intuitive counseling, past life retrieval and analysis, mediumship, and spirit guide conferences (including speaking with one’s Soul). Corbie speaks and counsels at holistic expos, seminars and workshops throughout the US and Canada, as well as in one-on-one sessions with clients worldwide. After our Soul Plan Reading yesterday, I sat for a long time, just blown away. I felt such a great shift. I think my true healing has just begun. I cannot thank you enough. I had two wonderful readings this weekend from the incomparable Corbie Mitleid. I ADORE HER, what a talent! What an honor it is that a reader of Corbie’s caliber uses my deck as her “Go To Deck” — so humbling! As a metaphysical bookstore that has been in business for well over 25 years, we have learned to be discerning about who we have teach or read at our store. We expect a certain degree of experience and professionalism in our presenters. Corbie Mitleid is first rate. She has a wide range of knowledge about many spiritual and metaphysical concepts. She conducts herself as a true professional holistic educator. Delivery and wit are Corbie’s trademarks. And she’s also a lot of fun! When it came time to speak with my Soul – or as Corbie says, my Higher Self – it was very clear that this was someone speaking through Corbie, rather than Corbie herself. The voice changed, the expressions changed, the word usage changed. And I cannot begin to express the love, the lack of judgment and the understanding that I received from this celestial being. The end of the session found me in tears. Some souls descend with a contract so densely packed with life lessons that they grow into mighty lights of compassion and wisdom. You will instantly feel yourself expanded by Corbie’s wit, practicality and vast intuitive knowledge of how to navigate the Earthwalk with grace and joy. I’m delighted to announce my second book! Available on Kindle (on Amazon) and in Paperback (HERE). 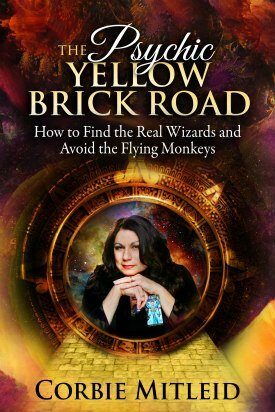 THE PSYCHIC YELLOW BRICK ROAD is the book that folks new to the world of psychic guidance have been asking for. It’s not about psychic development, but instead is your field guide to navigating the world of professional psychics: sharp, clear, and full of practical information for those who are intrigued by the idea of using intuitive assistance, but have no idea where to start. Why do some people have terrible experiences? Why do they end up going from reader to reader, never finding what they need? Because they didn’t have a reliable GPS (Guide to Psychic Services) to take with them on their search. But now, YOU CAN! I’ve been a reader for 45 years, 25 of them professionally. I’ve heard all the questions, seen all the mistakes, and I want to give YOU the secrets to making every single psychic session a valuable one. 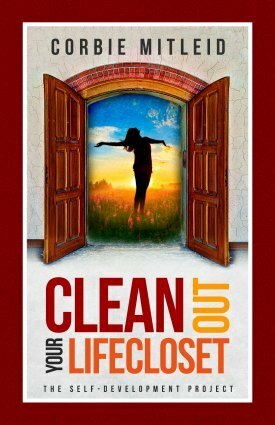 CLEAN OUT YOUR LIFECLOSET is the first volume in The Self Development Project series. I wrote this volume to help you get un-stuck from believing that you can’t solve your problems, you can’t get out of your own way, that you’ll fail…that you’re just not good enough. The delicious secret to the book? It encourages you to write your own story of change based on your history, your life experiences, and your personal goals. Through stories, examples, and just-for-you-designed “Adventure Pages,” you can find your own answers, design your own toolbox, and discover that healing the old and creating the new can be positive, joyful and soul-satisfying. Available on Amazon as Kindle, Paperback and Audiobook. Want yours autographed? Get it directly from Fire Through Spirit HERE. 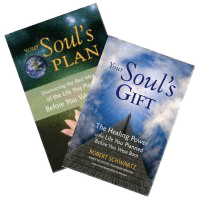 You may have found your way to my site after reading the international bestsellers YOUR SOUL’S PLAN and YOUR SOUL’S GIFT. I’m one of the featured psychics in both books, where my expertise is in past life retrieval and channeling people’s Souls for them to talk to. When you know what your Soul Plan truly is, you can grab hold of your own dreams and make them your reality. When we design our Soul Plan for each incarnation, our Soulmates agree to play whatever role we need for growth, and always with Love at the core. What Is A Soul Plan? Learning how to determine the main themes of life in pre-birth planning helps you lead the Examined Life with ease, grace and joy, no matter what's ahead. Contrast is always part of a Lifepath. The Soul chooses to experience different sides of an idea to understand it fully and bring knowledge back to Spirit. Knowing how to get the most out of your reading is vital if you’re going to delve in to the psychic realm! Let me show you how to get the most out of your sessions, ask the right questions, and choose the right psychic method to bring you the answers you seek. Life can give you a one-card Tarot reading if you know how to find it. Corbie Mitleid explains how your everyday experiences can be as accurate as your Tarot deck pull. Ethics, standards and soul-searching are vital for anyone who wants to be a professional Lightworker. Psychic Medium Corbie Mitleid shares her tips. Love is among the most-often posed questions to ask a psychic. Professional Psychic Medium Corbie Mitleid discusses her detailed reading on the subject. Tarot card reading is the best known divination method today. The more you understand the cards and how they work, the faster you can make them work for you! This nine-card Tarot reading uses the energies of the Hogwarts Professors to help you understand tricky situations and how to Disapparate your confusion! How do you find your soulmate? Is this new person one? Corbie shows you two new Tarot spreads to give you the details so you don't miss the connection! Here is our treasure box that talks about different ways of accessing the unseen: channeling, mediumship, oracle cards, spirit guides and more! How Should I Work With My Spirit Guides? Spirit Guides and Angels can work in similar ways, but they are not always similar entities. Psychic Medium Corbie Mitleid explains the differences. What Are Oracle Cards Used For? Oracle Cards and Divination Decks are easy-to-learn tools for sharpening and expanding your own intuition. Corbie Mitleid describes what to look for. Oracle card spreads can give married couples tools for a happily ever after. Corbie Mitleid shows how reviewing the soul contract can benefit both partners. During a Spiritual Awakening, “everything is on the table” — changing habits, ideas, even our physical beings. Here, I help you understand what Spiritual Awakening is all about, and how to walk toward it with joy and confidence, not fear. Sometimes we love ideas but not the teachers who teach them. Corbie Mitleid explains how to separate one from the other so you don't lose the lessons. Relationships don't always have happy endings. But how do you make sure you grow, rather than stay hurt and angry? It's all about the questions you ask.